Following things, I found in the box of the Boult Audio Flex wireless headphones. The Boult Flex has been specially designed with a focus on active lifestyle use. In terms of design, the headphones look very decent with black, grey and light cream colour combination. And company used metal in lots parts, which gives little bit premium feel. The headset is made of two materials, to be honest — plastic with a matte finish on the chassis and a metal caps on the back of the ear cups. Talking about the button placements, the right cup has three multifunctional buttons, which lets the users turn on/off the device and a volume up, volume down and play/pause music tracks as well. The feedback from the button is good and easy to use as well. The good thing is that it can easily accessible while jogging. 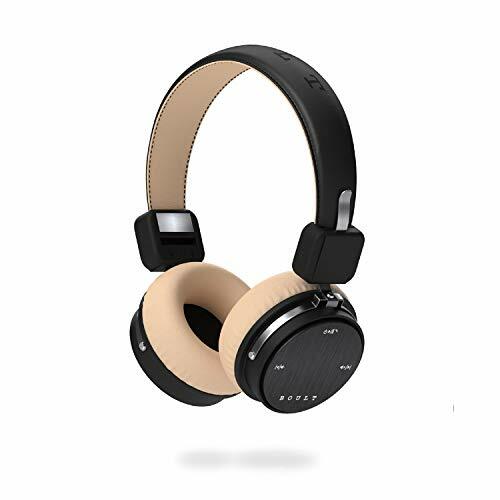 It has an ear cushion that is manufactured from artificial leather, which is very really soft and comfortable. It also has an adjustable headband that is really comfortable to wear and easy to pack away in your backpack. The headband is coated in soft material which gives a very comfortable experience and also helps reduce pressure. It’s got to be said that the Boult Audio Flex are some of the most comfortable Bluetooth headphones we’ve come across. The headphones weigh just about 170 grams and you can barely feel them once you’ve put them on. The headphone is IPX5 waterproof which means you don’t need to worry about sweat and rain. This Boult Audio headphones use one of the latest Bluetooth version i.e., Bluetooth v4.2 to give better signal strength. It can easily provide 20 ft. range without losing signal. You can easily connect with your Bluetooth enabled devices, including phone, Tablet, PC and smart TV. Just hold the power button for 5 seconds until the blue LED light starts flashing and you pair it with your device. The company promises up to 8 hours of wireless listening per charge (2 hours). As promised, the Boult Audio Flex offered a great battery life during our usage (5-6 hours). You can charge the device with the MicroUSB cable bundled. If you are too much worried about the battery you can use the 3.5mm audio jack. Noise isolation is decent. You can definitely use these headphones outside. And for better noise cancellation, you must select the perfect size earbuds. Talking of the performance, we wouldn’t Boult Flex the best in the business. However, it does its job at a steady pace. The audio quality of the headphone is good and you’ll be able to hear all the nodes clearly. The output from the Boult Flex was loud. It didn’t pain or pinch at the louder sound but yes I will suggest you not to use this headphone at a volume level above 75%. Like many mainstream Boult Audio headphones, the focus is on bass and the headphones deliver oodles of it. The bass sound is very punchy and high, which give a very energetic feel while doing the activity. After all, this one is sports focussed audio product. But in some music tracks, the deep bass on this headphone was missing and even some time bass was muddy. But practically, Lack of deep bass with such a price tag on the wireless headphone is not a big issue. The vocal and treble sounds are also good compared to the price we pay. At a price tag of Rs. 1500, the Boult Audio Flex is an amazing package for movie watching and GYM users. If you want good battery life, comfort, sweat resistance and something that is generally pleasing to listen to, these headphones are a very decent option. More info please watch the full review video on my youtube channel Geekman.